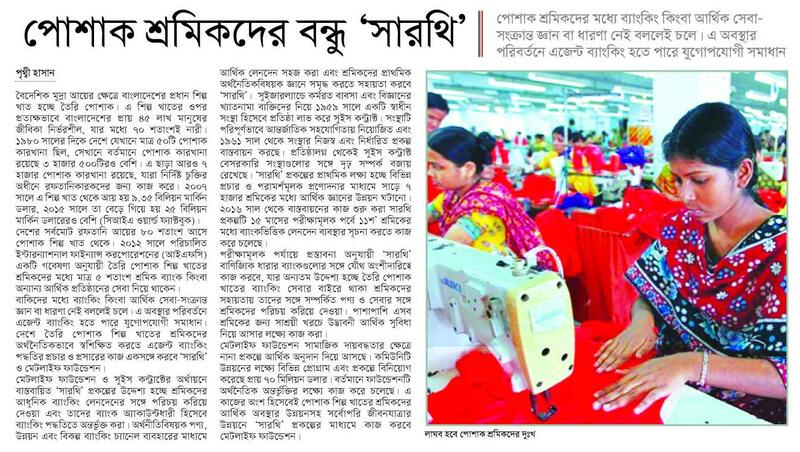 The Ready-Made Garments (RMG) industry of Bangladesh is among the largest sectors within the country’s economy, employing around 4.5 million workers and with a predominantly female workforce. There are 3,500 production facilities registered as exporters and another estimated 7,000 RMG factories that supply the exporters operating in the country. Enormous growth in the sector has continued to generate employment opportunities for workers with low level of skills. Most belonging to this demographic have no land and few, if any, financial skills. As a result, they are unable to manage their own finances. In addition, only about 5% of the RMG workers are able to access financial services. These services are provided, in part, through private cooperatives which often have questionable legal status. Formal financial services, such as opening bank accounts, are seldom provided. Building on the success of the Pilot Phase (2016 – 2017), Sarathi will ensure that at least 60,000 RMG factory workers have access to formal financial services through their bank accounts over a period of 30 months. As a result of owning bank accounts, these 60,000 RMG factory workers will receive their salaries in their respective bank accounts and be able to access and use other financial products, i.e. loan, savings, term deposit and credits to meet their financial needs. By working with at least three partner commercial banks and the 30 RMG factories, the project will help to set up multiple access points (e.g. agents, ATM booths, etc.) for RMG workers to conduct financial transactions. Additionally, these RMG factories will prove to be more compliant with their respective buyers in Europe, North America, etc. by ensuring transparency in the wage system. Consequently, RMG buyers will have significantly contributed to the financial inclusion of RMG factory workers by making digitised wage system a pre-requisite amongst all their sourcing factories. Two partner commercial banks, Bank Asia and NRBC Bank Limited, developed and launched two new financial products, which included a saving scheme and Deposit Pension Scheme (DPS) with a minimum deposit of BDT 200 and maximum BDT 5,000 per month over a tenure of three/five/seven or 10 years. 6,000 RMG workers attended financial counselling sessions at their respective factories. 15 agent outlets were operationalized by the end of December 2017.
over 1,200 RMG workers (almost all of them are women) now have bank accounts with two commercial banks (Bank Asia and NRBC Bank Limited) in Bangladesh. Access to credit with competitive interest rates: The RMG workers now have access to loans at 11% interest rate on their savings accounts. The interest rate (which ranges from 12.5% to 31.3% ) charged on this loan is significantly lower than the interest rates charged by microfinance institutes in Bangladesh.